“a woman walks into a bar…” Would you believe? At Whole Foods! 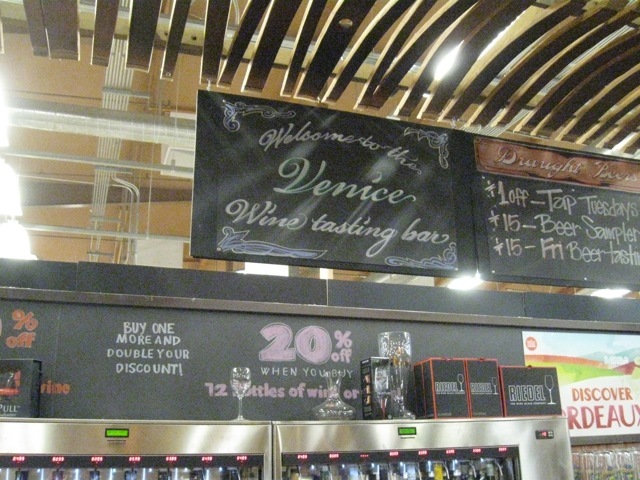 Yes, people, there’s a wine bar at Whole Foods. Actually, at several Whole Foods. What? Now you can get everything from soup to nuts, to colon cleansers, to wine bar hospitality all in one place. Yes, curiosity got the better of me so I had to investigate and headed down to Venice. California, that is, hotbed of the laissez-faire, politically correct lifestyle, contradictions included. The parking lot’s packed. This is one gigantic WF, juxtaposed beside a 99¢ store, it’s like a small city. You could troll the aisles for days, and maybe even live there behind the stacks, existing on product samples. There’s enough food in this one store to feed a starving country. Seriously. I wend my around the maze of food islands, a blitz of smells accompany me to the wine bar. There it is, tucked into a cove behind towering wine stacks, a comfy retreat from the mind-boggling food displays. A few folks stand around with their cheese plates and wine flights; the lights are definitely not flatteringly low. This is not a dive bar. I pull out a bar stool and take my place, a lone guy one over on my right, a girl with a really intense vibe (at WF?!) commenting of the wine, the cheese, on my left. Bruno will be your wine guy tonight, says Drew. You can cut Bruno’s indeterminate accent with a hand-forged steel blade knife. Turns out he’s from Normandy, divorced, adores his rescue African Ridgeback, Margot. Which also happens to be my sister’s name, and who could well have been a ferocious African Ridgeback in a former life, morphed into a ‘human’ in this one. Just sayin’. Bruno handles the wines like a chef at Benihana’s – pouring wine, popping a cork, slicing cheese, plating the goodies seemingly all at once, and carries on a running dialogue of answering questions and knowledgeably talking about the wine. Ok, so, Gary, the software engineer to my right makes sure to inform me he has a fiancée. Just in case, no mixed signals. It’s Saturday night, dude, shouldn’t you be out with your girl? I venture: “She’s home?! Maybe you better call just to be sure…” He, confidently: “Oh yes, she’s home. She’s either playing poker there or playing out at Hollywood Park.” Hmmm, interesting. I like the stereotypical role reversal. He quickly finishes up, says goodbye to ride his bike back to the house. Honey, I’m home! Intense girl leaves, guy takes her place. Two more women to his left arrive as do others. Some are surprised to see the wine bar and laugh at the idea but are quickly converted and order up a flight. The wines this night are all New Zealand and Australian reds, and they are good. Very good. The first was a Tohu Pinot Noir 2008, Marlborough, NZ. Delicious, medium bodied pinot. Fruity with complexity (like some of my friends). Next was Amisfield Pinot Noir 2006, Central Otago, NZ. A bit heavier, excellent. I should insert a note here about my personal tasting notes. I either like a wine or I don’t. Very simple. It’s delicious or forget it. Nothing complicated. And California wine is not my style, with some exceptions, of course. So that’s my bias. Anyhow, the new guy to my left is sort of enigmatic. We talk politics. He: “I’m not interested in democracy all that much.” Really? He’s smug, smart and nameless. Comes here four nights a week. Hard to imagine that WF is the biggest chunk of his social life but works for him, I guess. Next wine up: Yalumba “Bush Vine” Grenache 2008, Barossa Valley, South Australia. Another good one. I say this tasting is rockin’. Bruno calls it’s ‘the Bruno effect’. 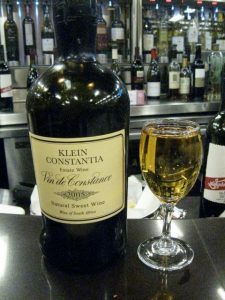 He definitely knows his wine and pretty much all the local gossip including the wine business. Note to self: great resource. Another wine: Jim Barry, The Cover Drive, Coonawarra Cabernet Sauvignon, 2008 and Domaine Gallety Récolte, Côtes du Vivarais, 2008. All really good. As if on cue, everyone suddenly consults their iPhones. Conversation halts. Was that a cosmic signal? I wouldn’t know because I’m the only one with a dumb phone. I guess it’s like taking a bathroom break or an electric car. You can only go so long without being plugged in and recharged. iPhone break over, conversation resumes. Drinking continues. 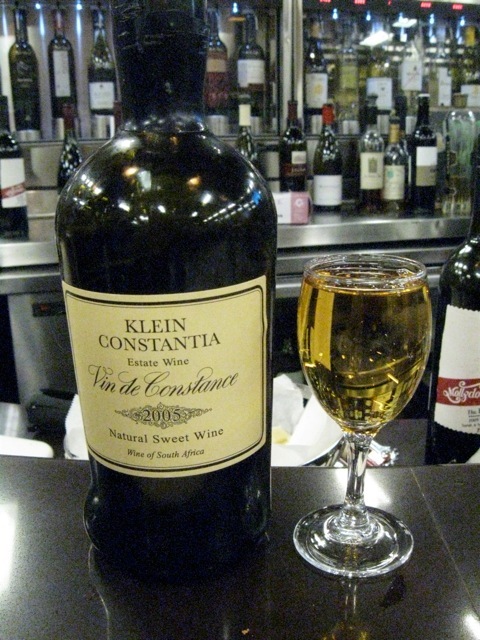 We try a French wine off the flight: Domaine Gallety, Syrah 2008 and a lovely sweet wine, Klein Constantia “Vin de Constance” 2005, South Africa, to finish up. Wonderful. Ooops, it’s closing time, 10p. You are in a grocery store, after all. Bills paid, people make their way out through the aisles of food and produce, vitamins and organic onesies. Interesting. 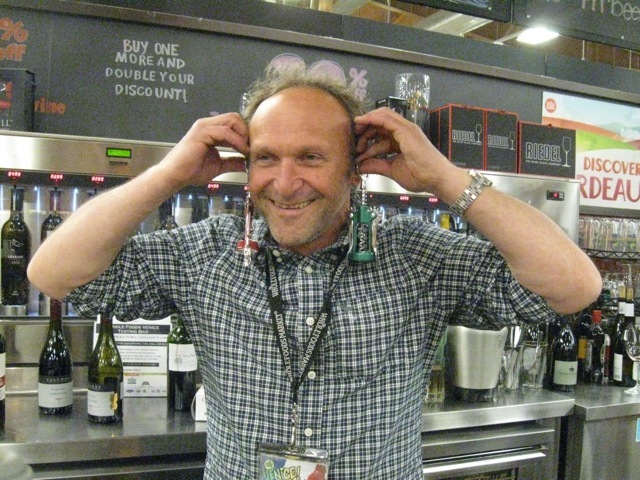 I guess you could call this a Whole Foods and Drinks experience. A word about the tastings. They are $15 for a flight of 5 wines with a very generous cheese plate, prosciutto, and assorted goodies. And beer tastings, too. Check it out. Very cool ju-Ju…love the Margot bit! Sounds like a great discovery to pair with your tofu poppers.